Walt hired George McGinnis in 1966, and right away George found himself in design meetings with his new boss. 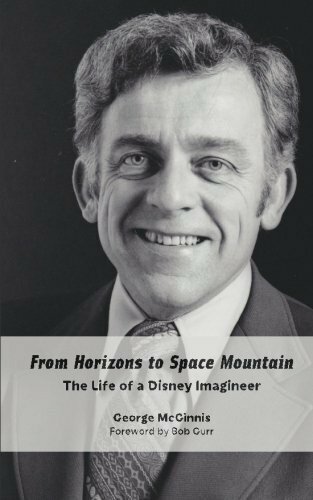 For the next three decades, George contributed to such high-profile projects as the new monorails, Epcot's Horizons, and two Space Mountains. Working alongside Disney luminaries like Marty Sklar, Bob Gurr, and John Hench, George brought his unique background as an industrial designer to the creation of the Mark V and Mark VI monorails, and much of Disneyland and Walt Disney World's Space Mountains. His concept art, often begun on the back of napkins, influenced the final look of many theme park attractions. George writes in detail of his Imagineering work; his interactions with Walt and many of the company's Imagineers, engineers, and artists; and his career after Disney, which included the design of trolleys for billionaire real estate developer Rick Caruso's upscale California communities. But George's heart and soul went into one attraction no longer in existence: Horizons. As the manager of Disney's Industrial Design Department, responsible not just for Horizons but for other Epcot attractions, George takes readers truly behind the scenes during what many fans consider Epcot's golden age. SHARE THE LIFE OF A DISNEY IMAGINEER!